After deservingly gaining promotion last summer, Nottinghamshire has begun the 2018 county season with a bang. Having won three of the five games so far, the six-time Championship winners are looking good to win the Championship title this summer. Even after losing their last game against Lancashire, the Notts are sitting on top of the points table in Division 1. Having finished the 2016 county season at the bottom of the points table in Division 1, the pressure was immense. Even with the likes of tried and tested international stars such as Alex Hales and Stuart Broad in their ranks, the team had failed to avoid relegation. Not that the 2016 season had begun well for them. Matters began worsening right from the start, when batsman James Taylor was forced to announce premature retirement from the game at 26, owing to a critical heart condition. The shock reverberated throughout Trent Bridge when the Notts hosted Surrey for their first match of the season. The entire season, despite some occasional brilliance from Jake Ball and Harry Gurney, saw Nottinghamshire drowning into the depths of nadir. After being completely outplayed by opponents in 2016, Nottinghamshire came back strongly in 2017. Chris Read, the veteran wicketkeeper-batsman, led the team with zeal and courage. The team made some interesting signings in 2017. A couple of youngsters namely, Matt Milnes and Ben Kitt, were inducted into the senior team from the club’s youth development system. After winning 7 of their 14 matches in Division 2 (5 draws and 2 losses), Nottinghamshire defied all odds to earn back its place in Division 1. The promotion also brought happiness and excitement at Trent Bridge. Nottinghamshire’s meteoric rise is quite similar to that of Essex, the defending champions. Nottinghamshire stormed into the top division owing to some impressive performances last summer. Proven international stars in James Pattinson (Australia) and Cheteshwar Pujara (India) made their presence felt every now and then. Pattinson, in particular, contributed with both bat and bowl. Chris Read, playing his last season, defied all predictions and played an instrumental role in helping his side gain promotion. 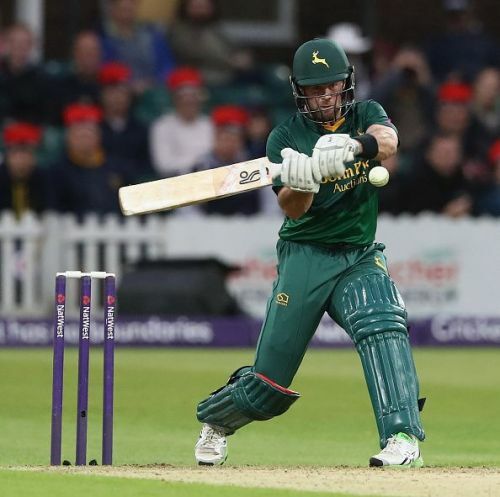 The likes of Steven Mullaney played inspiring cricket to give Nottinghamshire a memorable entry into the Nottinghamshire division of county cricket. Notts’ Steven Mullaney had a fruitful season personally. He scored 620 runs in 11 County Championship matches at a healthy average of over 40. Mullaney has been a versatile cricketer for Nottinghamshire, he has batted as an opener, and in the middle order as well. Also, he has opened the bowling for his team. So, it won’t be an overstatement to say that the 31-year-old has played just about every role since joining the club in 2010. Before joining Nottinghamshire, Mullaney played for Leicestershire. A striking feature of the team’s batting line-up has been a blend of youth and experience. Veteran batsman Chris Nash was signed from Sussex before the beginning of the season in order to beef-up the batting line-up. New Zealand’s Ross Taylor is also a part of the team for the first three months of the 2018 season. The 34-year-old batsman is available for the entire Royal London One-Day Cup as well as eight Championship matches. Having lost Zimbabwe’s Brendan Taylor (who was earlier a Kolpak player for the Notts) to national duty before the start of the season, the green shirts have chosen an ideal replacement for Taylor. Ironically, it has been a case of one Taylor replacing the other for Nottinghamshire. The Notts aren’t just banking on overseas talent in their bid to win matches. Youngsters in Jake Libby, Billy Root, and wicketkeeper Tom Moores are quite capable of contributing vital runs if and when the team is caught wanting in the matches to come. Billy Root, in particular, has been an exciting young prospect for the club. The 25-year-old lad from Yorkshire has already scored 501 runs in eight first-class games with an average hovering in the mid-40s. A renewed focus on adding batting depth also saw the club roping in all-rounder Paul Coughlin from Durham. It is a good opportunity for the youngster to learn from the likes of Samit Patel and skipper Steve Mullaney. With a decent reserve of all-rounders under its kitty, the club has adequate batting depth to work with. As far as the bowling unit is concerned, Nottinghamshire’s arsenal looks packed with the likes of tried and tested international quicks in Stuart Broad and Jake Ball leading the attack. Stuart Broad, the lanky paceman needs no introduction. With more than 400 wickets in international test cricket already under his belt, he is capable of ripping the heart out of any given batting line-up. The 31-year-old would, however, be available for only a handful of Championship matches owing to national commitments. Youngsters in Matthew Carter and Matt Milnes can be seen sharing the dressing room with and giving company to the likes of Harry Gurney and Luke Fletcher, both of whom are tried and tested names within the county circuit. By storming into the top flight of county cricket last season, Nottinghamshire has banished the ghosts of the 2016 season. Having made a promising start to their County Championship campaign this year, the men in dark green can only hope that the best is yet to unfold. With a fresh perspective in place, the club can expect to re-establish its dominance in 4-day cricket this year after overpowering its opponents in 50-over cricket last year.